Remastered Led Zeppelin albums now available for lossless streaming | What Hi-Fi? 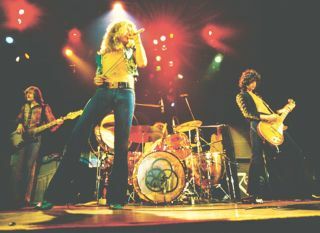 Six of Led Zeppelin's studio albums are available to stream in lossless, CD-quality for the first time. All of them have been remastered by lead guitarist Jimmy Page, and are now available on Deezer Elite, Tidal and Qobuz. The albums: Led Zeppelin I; II; III; IV, Houses of the Holy and Physical Graffiti are available to stream right now on the CD-quality streaming services - Deezer Elite, Tidal and Qobuz - in FLAC format. Deezer Elite is currently only available in the US - the service is due to come to the UK on Sonos in March. Speaking to Tidal, Page explained his reasoning for undertaking the remastering project, saying: "The criteria of it was always – and still is – quality". Talking about the original CD releases, Page said: "Twenty years ago we did it for CD, and of course, it’s analogue tapes that were originally intended for vinyl, so you’ve got all this catching up to do. Things change – within five years things are changing. "So you’ve got to have your material mastered to that format to the way that you see it and hear it; otherwise, they’ll do it for you, and they’ll f*** it up. That’s what happened when Atlantic put out the first set of CDs. They were horrible! Absolutely appalling." The deluxe remastered versions of the albums also include rare studio outtakes and various different versions and mixes. Page says he wants to future-proof the band's catalogue: "We did this so that our catalogue can now be out there in whatever format people are listening to music on - and I've also done super high resolution versions for whatever comes next - and in the process I found I could hear things that I hadn't heard in years."